In our every day lives we find the need to visit a Grocery Store for products that we need. 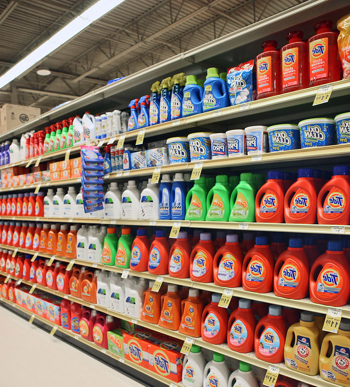 These products include fresh food, soaps, cleaners, vitamins, and so fourth. As we walk into visit a Store, all of the products and merchandise they sell are mostly displayed on what is known as Gondola Shelving. 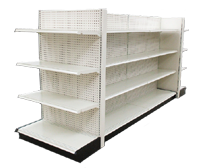 Grocery Store Shelves can be configured in a double sided configuration, a single sided configuration, or as an end cap that is normally located or placed at the end of an isle for double sided shelving. Sizes range from 36" high to 96 " high, shelf depths range from 8 inches deep to 30 inches deep. The widths start at 24 inches wide and they are available in a 30 inch wide, 24 inch wide, and a 48 in wide section also.